RISK MANAGEMENT DEBATE: Is ERM a total fraud? Join Hans Laessoe, founder of AKTUS and former CRO of LEGO, and Alex Sidorenko, for another thought-provoking risk management debate. On the 2d of August we will talk about ERM and what it means to the risk management profession. Join us for this very entertaining debate. 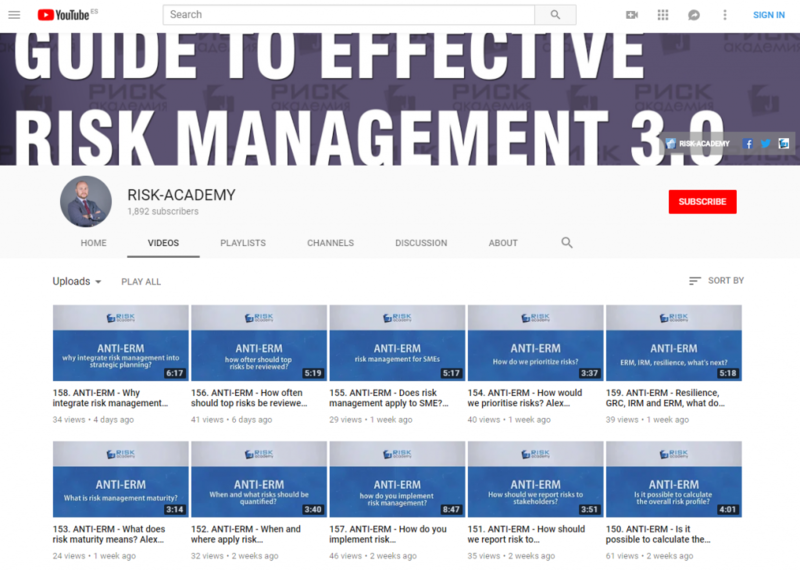 FREE REGISTRATION: https://events.genndi.com/register/169105139238458453/32294926ac Alex will argue how most common ERM… Continue reading RISK MANAGEMENT DEBATE: Is ERM a total fraud? The Great Debate Part III: Can ERM Realize its Potential in the Real World? In our first two webinars, our panel discussed the pros and cons of the updated COSO and ISO guidance on effective risk management. They left us with the idea that while both updates are improvements on their prior versions, neither is fully satisfying. In this, the third webinar in the Great Debate series, our panel… Continue reading The Great Debate Part III: Can ERM Realize its Potential in the Real World? THE RISK DEBATE CONTINUES: Why risk matrices are immoral… or are they? Join J.D. Solomon and Alex Sidorenko on 3 May 2018 to debate whether risk matrices/heat maps have a place in risk management or should they be avoided like plague. For anyone following my blog for a while, you know how much I dislike qualitative risk analysis techniques in general and heat maps in particular. I… Continue reading THE RISK DEBATE CONTINUES: Why risk matrices are immoral… or are they? The great debate – Alex Sidorenko vs Chris Mandel – is ERM real? Yesterday was a great day. I had great fun debating ERM with a good friend, Chris Mandel, SVP Strategic Solutions, Sedgwick and Director, Sedgwick Institute. We started talking about ERM and what it means for business but quickly switched to many other fascinating topics, including integration of risk management, decision making, cognitive biases, quantification, showing risk management… Continue reading The great debate – Alex Sidorenko vs Chris Mandel – is ERM real? Mark your calendars. Another great risk management live debate is coming up. This time I am meeting Chris Mandel to argue whether ERM a value-adding concept or yet another consulting bag of tricks? Is this a useful concept that adds value to the decision makers and the organization as a whole, or is it just… Continue reading Great debate – ERM good or bad?